In early December the North Carolina Department of Transportation released its draft of the 10 year State Transportation Improvement Program, otherwise known as STIP. The draft schedules the projects proposed for full or partial funding across the state in the Final 2016-2025 STIP. This is one of the final steps toward implementing the new Strategic Transportation Investments (STI) Law. The Strategic Transportation Investments (STI) Law allows NCDOT to maximize the state's existing transportation funding to enhance the state’s infrastructure and support economic growth, job creation and high quality of life. STI establishes the Strategic Mobility Formula, a new way of allocating available revenues based on data-driven scoring and local input. Under the new law NCDOT will be able fund 303 more projects and create about 126,000 more jobs than under the old formula. This is a 273% increase in highway projects and a 172% increase in jobs compared to the old formula according to NCDOT. Using the new formula over 10 years NCDOT will fund 478 highway projects and 300,000 jobs, compared to 175 highway projects and 174,000 jobs using the old formula. The current draft includes nearly 1,100 projects statewide and includes some key transportation routes in the High Country. NCDOT will hold a public comment period and public meetings in March and April to seek input on the Draft STIP. The Board of Transportation is expected to approve the Final 2016-2025 STIP in June 2015. At the bottom of the page you can find maps and the complete PDF of the draft plan. Projects in the list for the High Country are listed below starting with ID Number, Location/Description, Length. US 221 to SR 1107 (NC 105 Bypass) in Boone. Widen To Multi-lanes. SR 1136 (Clarks Creek Road) to SR 1107 (NC 105 Bypass) in Boone and construct new bridge over Watauga River and left-turn lane at SR 1112 (Broadstone Road). US 421 in Watauga County to US 221 Business/NC 88 in Jefferson. Widen To Four Lanes Divided. US 221 Bypass to US 221 Business/NC 88 In Jefferson. North of NC 268 to multi-lanes north of Blowing Rock. Widen To Multi Lanes. US 321/US 421 Junction Near Vilas to SR 1107 (105 Bypass) – Termini Of Proposed Boone Bypass (U-2703). Widen To Multi Lanes. Blowing Rock Post Acute Care Facility. Construct Access Road. NC 105 Intersection. Construct Upgrades. College Street Intersection. Construct Improvements. US 321 (Blowing Rock Road) to NC 105 Bypass. Upgrade Roadway. US 421 (King Street) To SR 1306 (Howards Creek Road). Widen To Multi Lanes. US 421/US 221 To SR 1522 (Deerfield Road). widen roadway to 12-feet lanes With 4-feet paved shoulders. Replace Bridge No. 5 Over Watauga River. Replace Bridge No. 200 Over Creek. Replace Bridge No. 25 Over Creek. Replace Bridge No. 87 Over North Fork Creek. Replace Bridge No. 59 Over South Fork New River. Replace Bridge No. 278 Over Middle Fork Creek And Realign Intersections of Us 321 With SR 1540 and SR 1531. Replace Bridge No. 55 Over Creek. Phase I: Wilson Drive In Boone. Construct Four-foot Paved Shoulders. Middle Fork Greenway, Phase I. Tweetsie Railroad To Sterling Creek Park. Construct 10 Feet Wide Multi Use Path Along Middle Fork New River. South Side of US 421 to north side Of 600 US 421 at the New River. Construct Underpass Along The Western Bank Of River. NC 194 To US 221 Business In Jefferson. Upgrade Existing Roadway. Replace Bridge No. 10 Over South Fork New River. Replace Bridge No. 49 Over Buffalo Creek. Replace Bridge No. 355 Over South Fork New River. Replace Bridge No. 177 Over Beaver Creek. Replace Bridge No. 273 Over Big Horse Creek. Replace Bridge No. 296 Over North Fork New River. Replace Bridge No. 69 Over Little Helton Creek. Replace Bridge No. 337 Over North Fork New River. Replace Bridge No. 327 Over Creek. Replace Bridge No. 309 Over Silas Creek. Replace Bridge No. 48 Over Big Helton Creek. Acquire Land And Existing Hangars North Of Runway 10 Threshold And Adjacent To Airport Property. Replace Bridge No. 141 Over Creek. Replace Bridge No. 16 Over Horse Creek. Replace Bridge No. 149 Over Horse Creek. Replace Bridge No. 125 Over Elk River. Replace Bridge No. 143 Over Linville River. 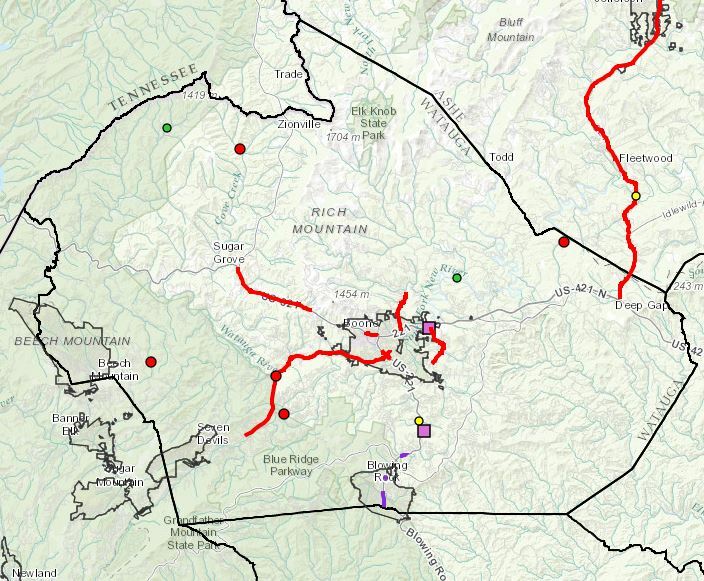 Screenshot of interactive map by High Country Council of Governments. Follow this link to view the full map. View or download the entire PDF of draft.